Welcome to the 12 Days of Christmas Giveaways! We wanted to spread a little Christmas joy and really get into the spirit of giving this year. So, we reached out to some of our friends in the industry and we were able to put together some amazing prizes to give to you all! All you have to do is download our free app, “Concealed Carry Gun Tools”, and we will send out push notifications each day with a link that you can follow to enter to win that day's prize, so make sure you have app notifications enabled or you will miss your chance to enter. There will be a separate notification sent out for each daily giveaway, and you must enter each day to win. No purchases necessary, no required sharing, just enter and you could win. A push notification will be sent to your phone from the “Concealed Carry Gun Tools” app at 12pm MT on December 9th. You will then have until 12pm MT on December 10th to open the push notification and enter. Winner will then be randomly selected on Facebook Live at 3pm MT on December 10th. Our friends at Pig Lube are revolutionizing the lubrication industry and they will send you their Pig Lube Range Kit and a 1 year supply of their lube and cleaner! This enhanced 26 piece compact Cleaning Kit is a top of the line kit designed to fit in your range bag and go wherever you go. It works for common handgun and rifle calibers and includes the new industry standard in lubrication and solvent from Pig Lube. No part was ignored or disregarded when they assembled these kits. All parts are the highest quality for optimal performance and durability. A push notification will be sent to your phone from the “Concealed Carry Gun Tools” app at 12pm MT on December 10th. You will then have until 12pm MT on December 11th to open the push notification and enter. Winner will then be randomly selected on Facebook Live at 3pm MT on December 11th. Liberty Home Concealment is a family-owned and operated furniture manufacturer located in southern Missouri. They strive to provide their customers with affordable, yet high quality concealment furniture options. All of their products are proudly made in the United States with US sourced materials whenever possible. This 31″ x 20″ flag that they will send you features a concealed locking compartment lined with closed cell foam that can be easily customized to fit any of the items you are wanting to store. It features a Digital RFID lock for an additional layer of security and is hand-painted and finished in a high-quality lacquer top coat. A push notification will be sent to your phone from the “Concealed Carry Gun Tools” app at 12pm MT on December 11th. You will then have until 12pm MT on December 12th to open the push notification and enter. Winner will then be randomly selected on Facebook Live at 3pm MT on December 12th. Caldwell Shooting Supplies put together this package that will make your next trip to the range even better! A push notification will be sent to your phone from the “Concealed Carry Gun Tools” app at 12pm MT on December 12th. You will then have until 12pm MT on December 13th to open the push notification and enter. Winner will then be randomly selected on Facebook Live at 3pm MT on December 13th. Our President, Jacob Paulsen, hand picked three of his favorite flashlights to go into this prize package for you. Whoever wins this prize will be prepared for any low light situation that may arise. A push notification will be sent to your phone from the “Concealed Carry Gun Tools” app at 12pm MT on December 13th. You will then have until 12pm MT on December 14th to open the push notification and enter. Winner will then be randomly selected on Facebook Live at 3pm MT on December 14th. Crossbreed Holsters will be sending you two excellent products that any concealed carrier can appreciate. Their Reckoning Holster and their Executive Belt. The Reckoning Holster features multiple points of retention adjustment including the ability to tighten the screws mounting the Kydex Pocket to the leather backer, and a retention device installed directly under the trigger guard. The Reckoning Holster can be worn inside of the waistband on the strong side, appendix, or cross draw positions. This can also be easily converted to an outside of the waistband holster with simple hardware. The Executive Gun Belt has a woven nylon webbing strap as a liner in their already tough, sturdy belts. This nylon core increases the support of the belt, making it stiffer, and keeps the belt from stretching long term. This liner is set in place with industrial adhesive between the layers of top grain leather, and as always, the belts are recessed stitched to keep a smooth look and provide for longer, fray free wear. A push notification will be sent to your phone from the “Concealed Carry Gun Tools” app at 12pm MT on December 14th. You will then have until 12pm MT on December 15th to open the push notification and enter. Winner will then be randomly selected on Facebook Live at 3pm MT on December 15th. Our buddy over at GrimReaperTactical.com knows that you can never have to much ammo. 500 rounds of .223 will turn into a whole lot of fun for the lucky winner of this prize. A push notification will be sent to your phone from the “Concealed Carry Gun Tools” app at 12pm MT on December 15th. You will then have until 12pm MT on December 16th to open the push notification and enter. Winner will then be randomly selected on Facebook Live at 3pm MT on December 16th. The MantisX training tool is changing the firearm industry by providing immediate and easy to understand data to any shooter. Just attach the MantisX tool to your rail, open the mobile app and start shooting. With every shot fired the mobile app will diagnose trigger, grip, and other weaknesses and give you clear direction to make the proper adjustments. A push notification will be sent to your phone from the “Concealed Carry Gun Tools” app at 12pm MT on December 16th. You will then have until 12pm MT on December 17th to open the push notification and enter. Winner will then be randomly selected on Facebook Live at 3pm MT on December 17th. Newbold's 6″ KD-Pivot Plate Rack Kit includes (6) 6″ KD-Pivot Targets in Orange, (6) KD-Base Mounts and (1) Set of their Alpha Stand Brackets and requires little assembly. All you have to do is add standard 2×4's to build a complete plate rack that is light weight, indoor and all-weather safe for use both at the indoor range or to be kept outside in any weather condition. The Knock-Down 6″ KD-Pivot Reactive Targets react and fall over backwards when hit leaving only a pin hole in the self-sealing target plate. It stays down until you reset it manually or by pulling on a string. Bullets pass through the 6″ KD target and the Pivot Base because they are both made of ElastiMAX™, thei tough, flexible, self-sealing polymer. Newbold’s Alpha Stand is an innovative set of target stand brackets that can be assembled in under a minute and are shoot through safe and ricochet free. These light weight brackets require no metal fasteners or hardware and make it simple and easy to transport your target stand to and from the range. A push notification will be sent to your phone from the “Concealed Carry Gun Tools” app at 12pm MT on December 17th. You will then have until 12pm MT on December 18th to open the push notification and enter. Winner will then be randomly selected on Facebook Live at 3pm MT on December 18th. Our friends at StealthGearUSA stepped up in a really big way with this awesome bundle that will go to one lucky winner. 1 – Holster of your Choice. Choose from their patented Ventcore® or SG-Revolution™ platforms. OWB and IWB options. 1 – Slim Wallet – Slim EDC wallet designed to be carried in the front pocket. A push notification will be sent to your phone from the “Concealed Carry Gun Tools” app at 12pm MT on December 18th. You will then have until 12pm MT on December 19th to open the push notification and enter. Winner will then be randomly selected on Facebook Live at 3pm MT on December 19th. I don't know anyone that gets to the range as often as they should. Studies show that it takes about 10,000 hours of doing something in order to build strong skills. Considering the potential liability of not being prepared to defend yourself when life is on the line, and considering the many challenges that prevent us from building the muscle memory needed to react quickly; most shooters are really set up to fail. If you want to win you need to supplement your live fire training with at home laser simulated training. To be fully prepared for a deadly encounter you need a tool like the SIRT to fill the gaps in your firearm training plan. A push notification will be sent to your phone from the “Concealed Carry Gun Tools” app at 12pm MT on December 19th. You will then have until 12pm MT on December 20th to open the push notification and enter. Winner will then be randomly selected on Facebook Live at 3pm MT on December 20th. This is not a mistake, Sports Afield will be sending you one of these safes. That is $999 safe shipped right to you completely free of charge. The Tactical LZ series of tactical gun safes provide total flexibility, accessibility and protection for both your weapons and your gear. Fire protection for 40 mins at 1200°. Proven to maintain interior temperature of less than 350 degrees. Water Proof for 7 days in up to 2′ of water. Electronic lock – programmable with anti-theft alert. 5 large 1.5” steel bolts. Black Matte 3 spoke handle. Exterior dimensions: 59” x 20” x 17”. Color: Black – Black Matte. Molle Door Organizer maximizes storage space and offers quick access to commonly used items. Gun Capacity: 6 + 4. Movable elastomer coated wire gun rests and plastic hanging accessory totes give endless configuration options. A push notification will be sent to your phone from the “Concealed Carry Gun Tools” app at 12pm MT on December 20th. You will then have until 12pm MT on December 21st to open the push notification and enter. Winner will then be randomly selected on Facebook Live at 3pm MT on December 21st. What giveaway would be complete without a gun? Our friends at Honor Defense made sure that this was a complete giveaway. They are donating one of their Honor Guard Single Stack 9mms. Every single pistol is assembled by Veterans and test-fired with a +P proof load. All parts and materials are manufactured 100% in the United States. Don't miss your opportunity to bring home of these beautifully American crafted guns. 1. Promotion Description: The '12 Days of Christmas' (“Sweepstakes”) begins on 12/09/2018 at 12:00 PM (Mountain Time (US & Canada)) and ends on 12/21/2018 at 12:00 PM (Mountain Time (US & Canada)) (the “Promotion Period”). By participating in the Sweepstakes, each entrant unconditionally accepts and agrees to comply with and abide by these Official Rules and the decisions of Concealed Carry Inc (“Sponsor”), which shall be final and binding in all respects. Sponsor is responsible for the collection, submission or processing of Entries and the overall administration of the giveaway. Entrants should look solely to Sponsor with any questions, comments or problems related to the Sweepstakes. 2. Eligibility: Open to legal residents of USA who are 21 or older. Void where prohibited or restricted by law. Sponsor and their respective parents, subsidiaries, affiliates, distributors, retailers, sales representatives, advertising and promotion agencies and each of their respective officers, directors and employees (collectively, the “Promotion Entities”), and members of their immediate families and/or persons living in the same household as such persons, are ineligible to enter the Sweepstakes or win a prize. 3. Winner Selection: The winner of the Sweepstakes will be selected in a random drawing from among all eligible Entries received throughout the Promotion Period. The random drawing will be conducted by daily within 3 Hours of the daily entry period closing by Sponsor or its designated representatives, whose decisions are final. Odds of winning will vary depending on the number of eligible Entries received. Winner will be notified by email at the email address provided in the Entry Information on or about 48 Hours after the random drawing. Potential winner must accept a prize by email as directed by Sponsor within 48 hours of notification. Any winner notification not responded to or returned as undeliverable may result in prize forfeiture. The potential prize winner may be required to sign and return an affidavit of eligibility and release of liability, and a Publicity Release (collectively “the Prize Claim Documents”). No substitution or transfer of a prize is permitted except by Sponsor. 5. Online Entry: Enter the Sweepstakes during the Promotion Period online by signing into the entry form and perform the tasks provided. 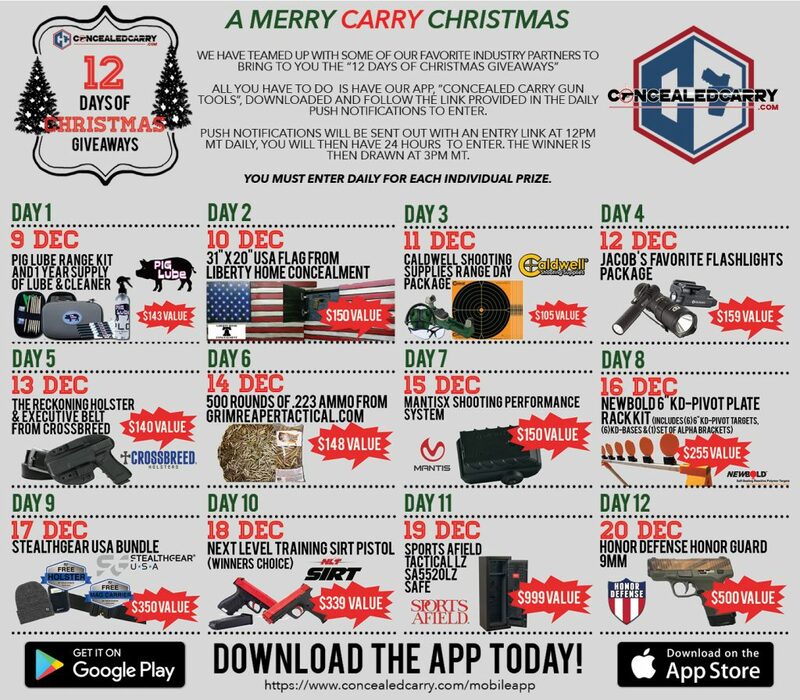 The entry instructions can be found on the following website at https://www.concealedcarry.com/12days. 8. Winner's List: To obtain a copy of any legally required winners list or a copy of the Official Rules, send the applicable request and a self-addresses, stamped, #10 envelope to Concealed Carry Inc cc: 12 Days of Christmas at 9060 Flora St Arvada CO 80005. Request must be received no later than 3 Hours + 6 MONTHS for the name of the winner and, by the end of the promotion, for a copy of the rules. Download “Concealed Carry Gun Tools” Now!